Does every country has a separate standard? If you're planning on traveling internationally, pack a power adapter that matches the plug standard for your destination. If you don't have the right adapter or need more than a plug adapter, you could accidentally fry your hair dryer. The many different plugs and standards across the countries make it necessary to check labels to reduce the risk of accidentally buying the wrong adapter or forgetting an essential converter. The two primary standards for current are Alternating Current (AC) and Direct Current (DC). The U.S. standard was developed during the famous war between Tesla and Edison. Edison favored DC, and Tesla preferred AC. The big advantage to AC is that it is capable of traveling greater distances between power stations, and in the end, it was the standard that won out in the U.S. However, not all countries adopted AC. Neither did all your devices. Batteries and the internal workings of many electronics use DC power. In the case of laptops, the power brick converts AC power to DC. Voltage is the force with which electricity travels. It's often described using a water pressure analogy. Although there are several standards, the most common voltage standards for travelers are 110/120V in the U.S. and 220/240V in most of Europe. If your electronics are only meant to handle 110V of force, having 220V shooting through them could be catastrophic. The frequency of AC power refers to how often the current alternates each second. In most cases, the standards are 60 hertz in the U.S. and 50 hertz everywhere that values the metric system. In most cases, hertz doesn't make a difference in performance, but it can occasionally cause problems with devices that use timers. Although there are a lot of different plug shapes, most travel adapters settle for the four most common. The International Trade Administration breaks these into alphabetical shapes A, B, C, D, and so on, so you can check to see if you need something beyond the usual four for your travels. Is a Power Plug Adapter Sufficient? A power plug adapter may not be all you need. You can buy USB adapters and use your USB-C cord with a USB-A plug. It seems like the same concept should apply. For many devices, it is that simple. Look at the back of your device where you find the UL listing and other information. In the case of laptops, the information is on the power adapter. The UL listing tells you the frequency, current, and voltage that your device can handle. If you're traveling to a country compatible with those standards, you only need to find the right plug shape. Devices usually come in three types: those that only comply with one standard, dual-mode devices that comply with two standards (switching between 110V and 220V), and those compatible with a wide range of standards. You may need to flip a switch or move a slider to convert devices with dual modes. If you plan to travel with a single voltage device to a country with a different voltage, you need a voltage converter. If you travel from someplace with lower voltage like the U.S. to a place with higher voltage like Germany, you need a step-up converter, and if you travel in the opposite direction, you need a step-down converter. This is the only time you should use a converter, and remember that you don't need to use them with your laptop. In fact, you might damage your laptop if you do. In rare cases, you may also need an AC converter to convert DC power to AC or vice versa, but your laptop uses DC power already, so do not use a third-party converter with it. Check with the company that made your laptop to see what you need. If necessary, you may also be able to buy a compatible power adapter in your destination country. Many international hotels have built-in wiring for their guests that don't require any special adapters or converters to use. Ask before your trip to see what your accommodations offer. The good news about USB-charging devices is that you don't need a plug adapter. Using one would probably ruin your charger. You just need a compatible charger. USB is standardized. Your charger is doing all the work to convert the voltage to the USB charging standard to power your phone. USB may be the best hope for standardizing power charging for the future. USB and wireless charging systems may be steps toward the next "electric plug" solution for international travel. Although the USB standard has changed over time 1.1 to 2.0 to 3.0 to 3.1, it has done so in a thoughtful way that offers legacy compatibility. You can still plug your USB 2.0 powered device into a USB 3.0 port and charge it. You just don't see the bandwidth and speed advantages USB 3.0 offers when you do. It's also easier to replace and upgrade USB ports over time than it is to rewire homes for new electrical standards. After a system of power transmission was established (AC versus DC), homes were wired for electricity, but there was no such thing as a power outlet. There wasn't a good way to patch something into the system temporarily. Devices were wired into the home's electrical network directly. We still do this with some appliances, like light fixtures and oven hoods, but at the time, there was no such thing as a portable electronic device. Soon different countries settled around different voltages and frequencies as power plants were built. Tesla recommended 60 hertz in the U.S., while Europeans went with the more metrically-compatible 50 hertz. The U.S. went with 120 volts, while Germany settled on 240/400, a standard later adopted by other Europeans. When countries were establishing their standards for transmitting power and houses were being wired to receive it, an American inventor named Harvey Hubbell II came up with the idea to let people plug their devices into light sockets. You can still buy power adapters you can plug into light sockets. Hubbell eventually improved the concept to create what we now know as the familiar outlet plug with two prongs. A few years later, a third grounding prong was added to make the socket a little safer and less likely to shock you when you plug things into it. American outlets also went with two different-size prongs to keep people from accidentally plugging them in the wrong way. Meanwhile, other countries began developing outlets and plugs without considering compatibility, although it was the outlet that made portable electronics possible. It was just a matter of which standard gained traction in each location. 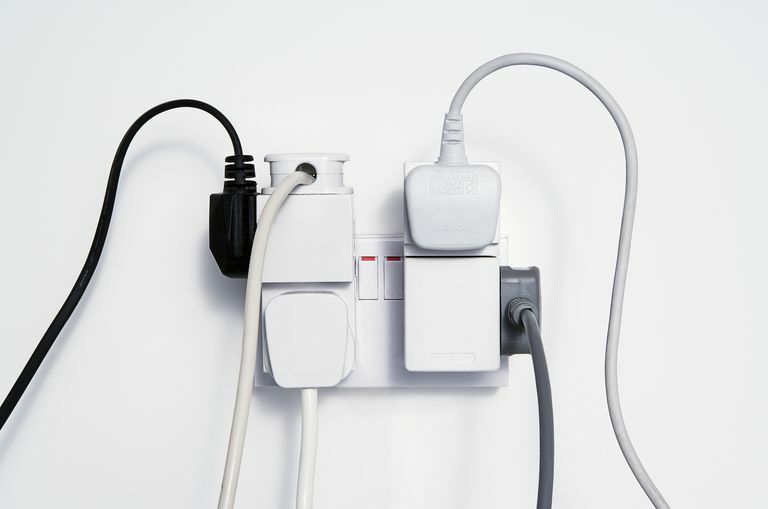 Like the U.S., most country systems also adopted a system that made it possible to plug in devices in only one way, whether it was by making the plugs different shapes, making plugs with three prongs, or situating them at different angles.